We ended up buying a whopping 4 kilos of strawberries, because it’s that cheap, and it’s that good. Strawberries are expensive elsewhere. Get them cheap here at La Trinidad Strawberry Fields for Php150/KILO (not those silly microscopic styro-containers with hidden bad berries at the bottom where you can’t see them), isn’t that amazing? Go on a morning. The strawberries are fresher and the weather isn’t as bad for the sun-sensitive (this area isn’t as cold as Baguio’s center), and there are less people. I intended to pick strawberries for myself at the farm, but I was told that the strawberries there were not ready for harvesting (this was early December. Season is usually Jan/Feb). And anyway its exaggeratedly more expensive than if you buy it yourself from vendors just outside the farm, close to Php500. You can pick the strawberries yourself from the piles and piles there, and for the trip home, it’s better to pick the green strawberries, which will last longer. We ended up buying a whopping 4 kilos of strawberries, one of our favorite fruits. 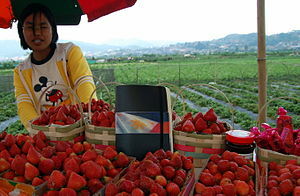 Important tip: Don’t go here nor buy any strawberries anywhere unless it’s your last day in Baguio. The trip back to Manila can and will destroy a good portion of your strawberries. Sagada oranges are also available, those huge monsters of an orange. Sweet orange of the smaller variety are also available, and the vendors are confident enough to give you a free taste. I was won over by one so I bought Php200 worth of oranges, yes. It’s a Php100 for 8 oranges, and I don’t regret them. My fridge was full of fruits for weeks! Alternatively, the farm also has lettuce and broccoli available for picking. At the time, only the lettuce was ready for harvesting. It’s a good alternative to strawberry picking, if you want to know where the green in your salad comes from and how it’s picked. It’s also incredibly cheap. Php 50 for 3 hand-picked lettuce. If you’re done trying to emulate the life of a farmer, walk outside and find out what other things are for sale. Try the “Money Back Guarantee” DQ Strawberry Ice Cream — walk further in, closer to the entrance of the farm. The ones near the mouth of the corridor leading to it sell inferior strawberry ice cream, and we were unfortunately scammed. Buy from the vendors who have the “Money back Guarantee – DQ Ice cream” plackards. They say it’s money-back because it’s really good, and DQ because they’ll flip it for you a-la Dairy Queen and it doesn’t fall. Haha. They did, those charming vendors, and they were right! It didn’t fall, and it was really good! Just the way I love my strawberry ice cream. It’s not too sweet, the sour-ish fruity tang of strawberry is still intact due to the bits in it. I’d come back for it, actually. Try the Strawberry Taho for Php30. It’s good and different, but I’m not a fan of overly-sweet colored-sugar syrup. There are big pieces of strawberry in it, though. Good deal for novelty! Native wood craft stores line the outside of the farm. Bought an ashtray for Php85. Don’t use it, like I did. How to commute there: Go to the jeepney terminal in front of the city hall, which is in the center of the city. It’s very famous and easy to spot anyway, and you can always ask around for it. Take the Baguio-Buyagan jeep, ask the driver to drop you off at Strawberry Farm. Do the reverse to go back. Trip is around 20-30 mins. depending on traffic. Enjoy your fresh fruits! Perhaps you can even make a salad with your lettuce and ‘berries, plus some nuts, carrots and tomatoes we bought along the way. Happy fresh eating! Oh, and here’s a photo of the impromptu salad we made from strawberries, tomatoes, carrots, and the lettuce we picked! Yum! baguio is nice place to vacation!